The Ki-32 is a Rank I Japanese light bomber with a battle rating of 1.3 (AB/RB/SB). It was introduced in Update 1.79 "Project X". The first thing you will notice upon flying the Ki-32 is that it is incredibly nimble, especially in AB. It can out-turn anything that's not a bi-plane. A spaded Ki-32 with no bombs can out-turn early Spitfires, and a smart pilot will use this incredible maneuverability to their advantage. However, all this maneuverability comes at a dangerous cost. With no armor, a vulnerable cockpit, and a weak airframe, you cannot afford to take any damage. As such, you should avoid engagements at all costs. As a low flying light bomber, your first priority should be bombing ground targets as bombing bases is impractical, due to your bombs dealing low amounts of damage to them. While your 9 x 50 kg bombs are efficient at destroying lightly armored targets like armored cars and AAA, and your 100 kg bombs can destroy light tanks, any heavily armored target like medium and heavy tanks or destroyers will shrug them off unless you score a direct hit, which is relatively easy to do due to the Ki-32's solid bomb accuracy. The Ki-32 also is very slow even when upgraded. With a stock top speed of 403 kph/250 mph and a spaded speed of 442 kph/275 mph, you will struggle to outrun anything that is not a Po-2. One of the two major downfalls of the Ki-32 is the limited protection it has. 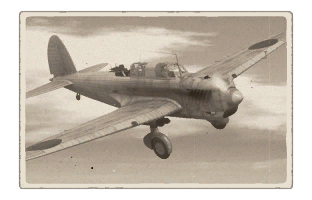 With an open cockpit, a fuselage made of fabric and wood, and no armour, any plane with guns can shoot it down. However, as noted, the Ki-32 is amazingly maneuverable, increasing its survivability if one knows how to use it correctly. It also mounts a twin 7.7 mm Type 89, which at this rank is quite powerful due to its high fire rate and the large area it can cover. The Ki-32 is a low flying bomber, so you should stay near the ground in order to destroy the ground targets. Do not bother with medium or heavy tanks, as your measly 100 kg bombs do almost nothing to them unless you score a direct hit, so go for targets like pillboxes, light tanks, AAA and armoured cars. Be sure to avoid any form of confrontation. Although you can outmaneuver pretty much anything you face, you cannot afford to take any hits, so the best idea is to avoid engagements all-together. However, if an enemy decides that you are worthy prey, you have a few tools at your disposal. Firstly, pull turn heavy maneuvers and try to get on their tail. While you only have a 7.7 mm machine gun, you may be able to hit critical modules or even snipe the pilot if you are accurate enough. Aim for the pilot, engine(s) and wings, as you have a larger chance of downing an enemy by aiming at these spots. If the enemy is diving on you, force them to overshoot through maneuvers and effective rudder usage then attempt to disengage during their zoom climb. I-153/I-16's. The Russian bi-planes and early Chaika's are universally feared planes. You can outmaneuver both of them, but they are quite fast for their ranks and sport 2-4 ShKAS machine guns that can mount entirely Incendiary rounds, which will shred your weak fabric and wood body in seconds. These ShKAS machine guns are arguably the best 7.62 mm guns in the game due to their high fire rate, good accuracy, powerful incendiary belts and good stopping power for their rank, so try not to get hit by any shot as they have a high possibility of critically damaging your plane, if not setting it on fire. Avoid them if possible, and if one thrusts a fight on you, seek assistance from teammates. D.501/D.510. The Dewoitine's are exceptionally dangerous opponents. They are highly maneuverable, have decent speed, and are the only 1.3 planes to mount a cannon, and what a cannon it is (Hispano 404). One shot of their Hispano is enough to down your plane. However, their airframe is quite weak overall and have a very vulnerable open cockpit. If one engages with you, attempt to make him use all of his cannon rounds then try to snipe out his pilot with your gunner. CR.42 Falco. The feared Italian bi-plane sports two powerful 12.7 mm BREDA machine guns filled with incendiary rounds, a very high speed for a bi-plane, and above average climbing characteristics. However, they are not as maneuverable as other bi-planes, so you can outturn it. If one is diving on you, force an overshoot then disengage. Being a bomber, acquiring the 10 inch (mod 24) module should be top priority. The weak airframe means that getting the survivability modules will help you survive attacks from unwanted visitors. New turret belts are beneficial as the gunner's stock belts contain ball ammunition which is almost useless. The Ki-32 was developed in response to a 1936 Imperial Japanese Army specification to replace the aging and inferior Ki-3. Both Mitsubishi and Kawasaki were requested to build two prototypes by Christmas. The specification required a top speed of 400 kph at 3,000 m with a normal operating altitude from 2,000 - 4,000 m and the ability to climb to that height in 8 minutes. The companies needed to choose between utilizing an 825 hp Mitsubishi Ha-6 radial, an 850 hp Nakajima Ha-5 radial or an 850 hp Kawasaki Ha-9-IIb liquid cooled inline engines. Have a fully loaded weight of less than 3,300 kg. The first Kawasaki prototype flew in 1937 and seven more prototypes were produced. The Kawasaki Ki-32 and Mitsubishi Ki-30 were virtually identical in terms of layout and performance, the main difference between the two were the engines. Mitsubishi used the Nakajima Ha-5 14-cylinder air-cooled radial engine, whereas Kawasaki opted to use their own Ha-9-IIb inline V12 engine. The Kawasaki design encountered engine cooling problems, thus awarding the Mitsubishi Ki-30 the production order. Despite this, the need for aircraft in the Second Sino-Japanese war, which had started at full scale in July 1937, allowed the Ki-32 to enter production 12 months behind its rival. However, there were more Ki-32's built than Ki-30 despite being an inferior plane. 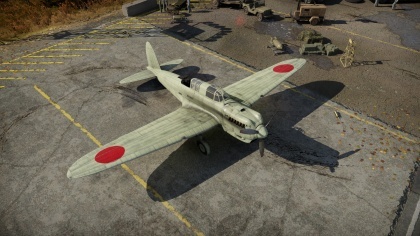 The Ki-32 was used extensively during the Sino-Japanese War, equipping the 3rd, 6th, 10th, 35th, 45th, 65th and 75th Sentai. It saw combat during the Battle of Nomonhan against Russia in 1938-1939. The plane saw its last combat action with the Imperial Japanese Army bombing the Commonwealth forces during the Japanese invasion of Hong Kong. During WWII, the Ki-32 were supplied to the Manchukuo Air Force in order to replace Kawasaki's old Type 88/KDA-2 light bombers, and were the main bombers of the service through the war. It was finally withdrawn from military service in 1942 and was re-purposed as a training plane. This page was last edited on 3 April 2019, at 04:05.